I woke up in a very comfy bed at 06.30 and thought great, another hour or so in aforesaid bed before I have to get up. I woke up again 3 hours later at 09.30; I must have been tired after yesterday’s long leg. Panicking slightly that I was going to be late setting off, with quite a few miles to do today, I rushed about getting ready noticing that thankfully my muscles, although tired, felt mostly fine. Breakfast consisted of a full English courtesy of Pete, Diane and Steve; I could get used to this having had cooked breakfast two days in a row. Steve had given my bike a clean by the time I got outside, and giving it the once over I found a loose spoke which I tightened up, nothing serious. 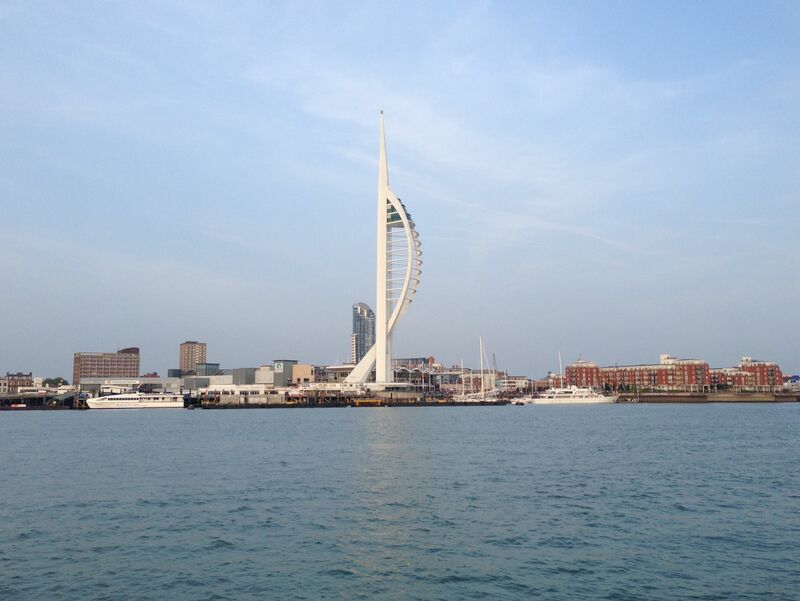 It was a another sunny day and I was looking forward to Portsmouth, the New Forest, visiting a few friends along the way and meeting up with Ian later. I packed up my things and was ready to go by 11.00, stopping to take a photo of my superb hosts (and Lobster because he doesn’t like being left out) before leaving; for once I remembered. Thanks for the bed, food, bike cleaning and encouragement All, and hope to see you again soon. 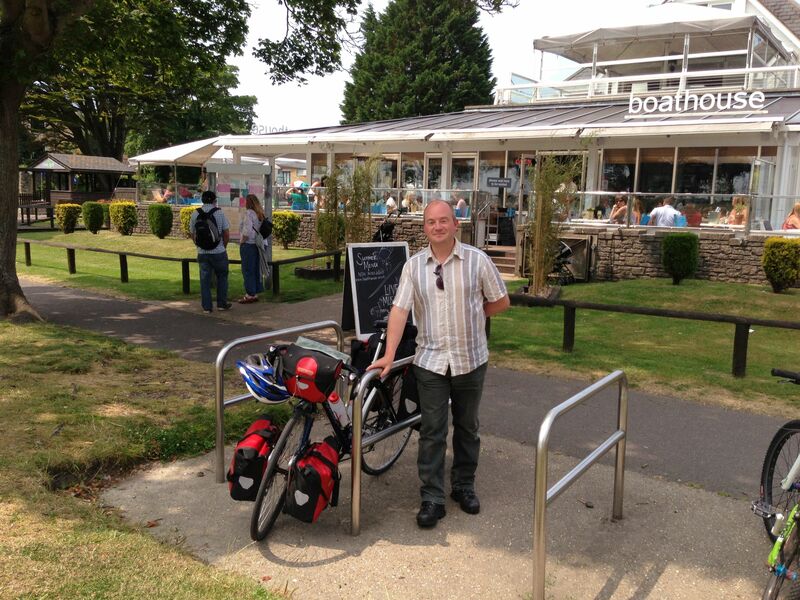 I pedalled off into Bournemouth on busy roads, making my way through the city and on to Christchurch where I had arranged to meet Chris, a friend from Norwich who was down visiting family. 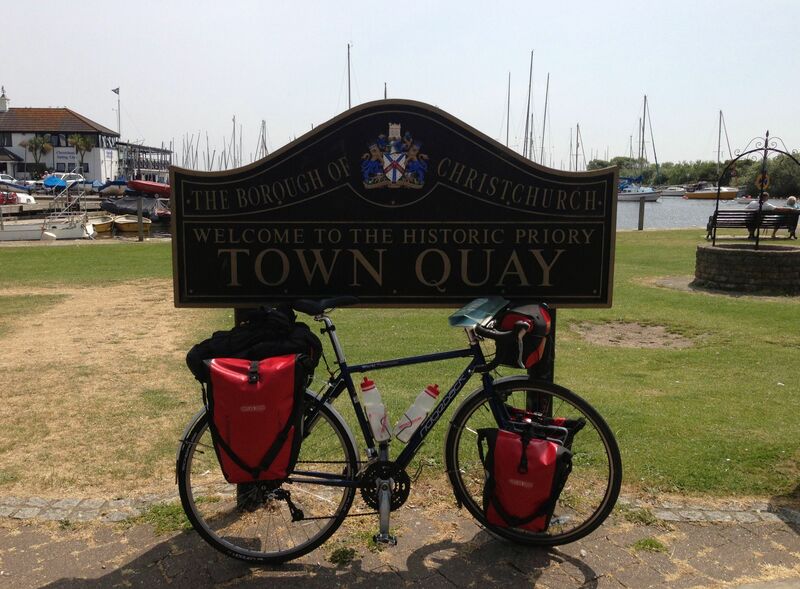 After fighting my way through lots of cars I arrived at the Town Quay, and it wasn’t long before Chris joined me. 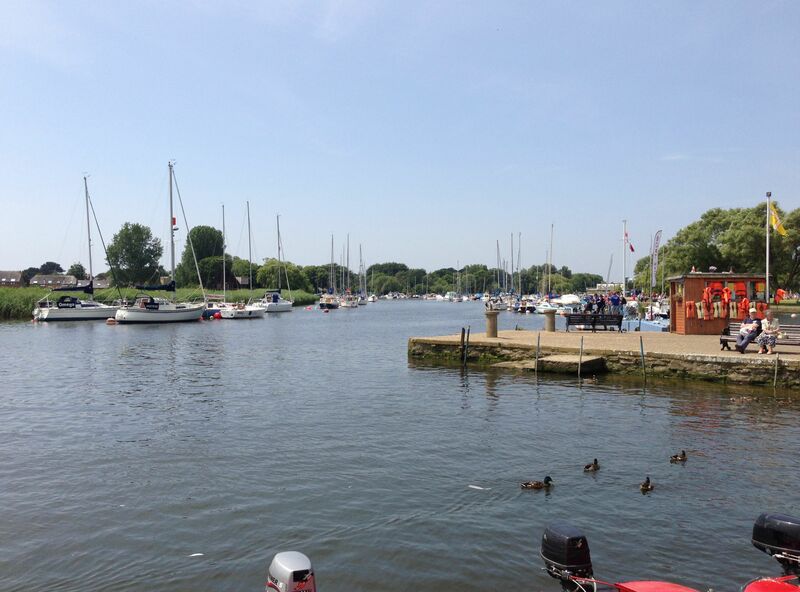 We adjourned to the Boat House Bar for a beer, which went down very well given the hot weather. It was good to catch up on the latest news from Norwich, although nothing of great import had occurred in my absence as far as I could tell. I did learn that the Alan Partridge film, Alpha Papa, was going to première in Norwich. “Jack-anack-anory” or “Kiss my face”, as Alan would say. It was also great that it was going to be shown at the Anglia Square Hollywood cinema, in the slightly more run down end of Norwich, perfect. This would give the area a well needed boost and was totally in keeping with the show. I realised that I’d missed friends from home, and it was good to hear about how everyone was doing, but I hadn’t missed them so much that I was in a hurry to get back quite yet. I think sometimes we’re afraid of moving away, either permanently or for a few months, because we think we’ll miss something, or things won’t be the same when you get back, or you won’t find the same sort of enjoyment or satisfaction elsewhere. Sometimes you just need to take a risk and I decided I’d continue to push myself to try new things, travel, and meet new people. You only live once, probably, so it’s not worth ending up regretting not trying something. 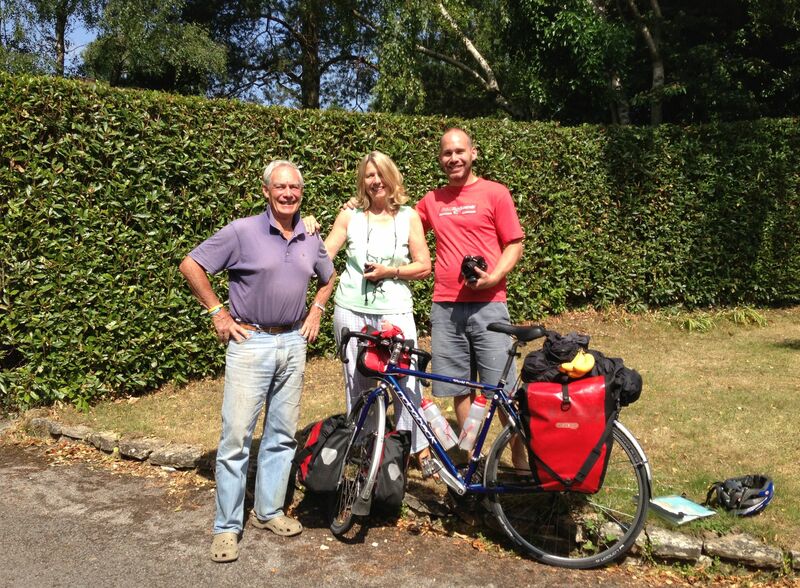 Bidding Chris goodbye I left Christchurch and rode on to the New Forest via New Milton and Lymington. It was getting hot and there was little shade, as there didn’t seem to be much in the way for forest as I pedalled down the B3054. It was mostly heathland, with an abundance of grazing New Forest ponies. The ponies seem to roam free in the forest, but are in theory owned by New Forest Commoners, with stock sold on in fares. Pony remains have been found in the area dating back to 500,000 BC, so they’ve been around a very long time. They certainly look like they own the place; I saw them standing in gardens, and on commercial garage forecourts, and wasn’t quite sure how you’d move them on if you needed to. I didn’t get any pictures in the New Forest, mostly because I was in a hurry to get on, but also because I didn’t pass through much of the actual forest bit as far as I could tell. I decided it was another place I’d have to come back to, to explore in more detail at some point. I’d really like to camp out for a few days in the forest and enjoy the surroundings. With time ticking on I cycled on to Hythe, where I intended to get the ferry over to just south of Southampton, thus avoiding the worst of the traffic. 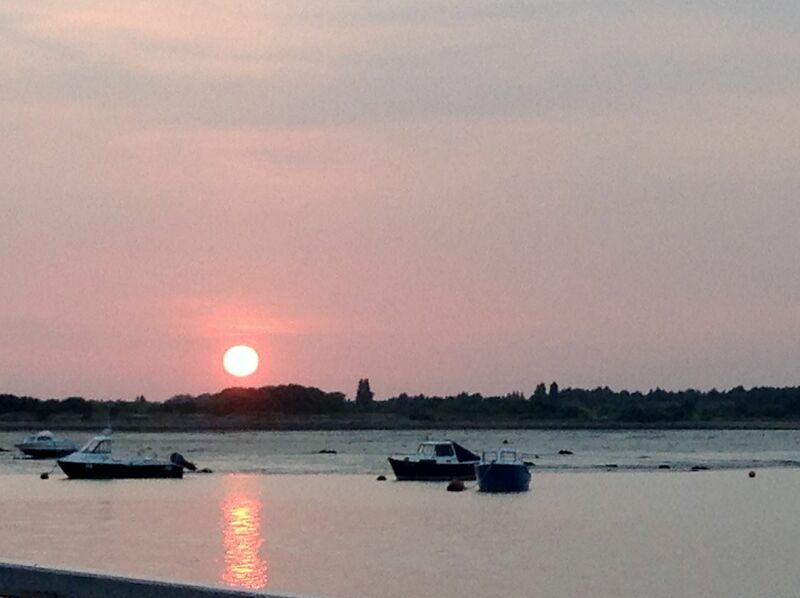 I had to cycle up a long pier to get to the ferry station at the end. There were kids jumping off the pier then swimming back to the shore, much to the irritation of the attendants. Whilst it was a little bit dangerous I didn’t see any harm in it, the water was deep enough and there were no boats around that bit. Let them have a bit of fun and take a few risks; reckon it’s good character building stuff. There were plenty of people around that would help if any of them got into trouble. The ferry arrived on time and I pushed my bike on board; I didn’t need to take the panniers off for a change for this trip. 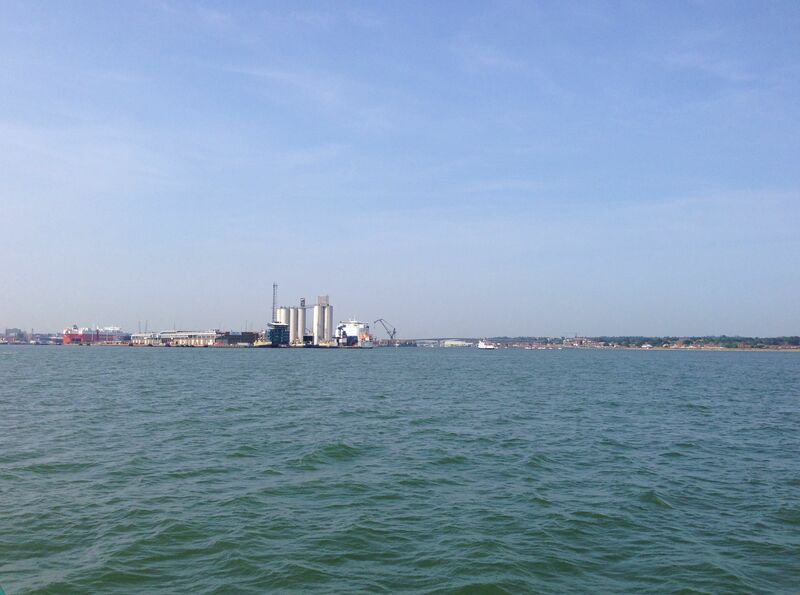 It wasn’t a long journey across, and I had chance to see Southampton docks, which were all pretty industrial. 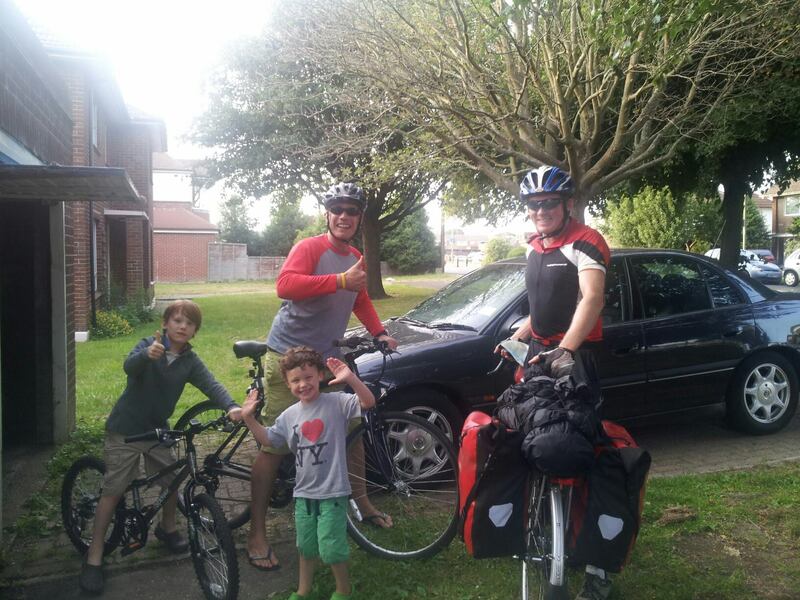 I arrived at the other side about 16.45, and rode on towards Portsmouth to visit my next set of friends for the day, Mark and Cecily and their sons Peter and Olly, who live in Gosport. Mark is Peter and Diane’s other son, who I’ve know since I was a baby. He’s in the Navy and often at sea for long periods, so it was great that he was on shore whilst I was passing, and it would be great to see them all again; I think the last time we all got together was probably a skiing trip in Switzerland. 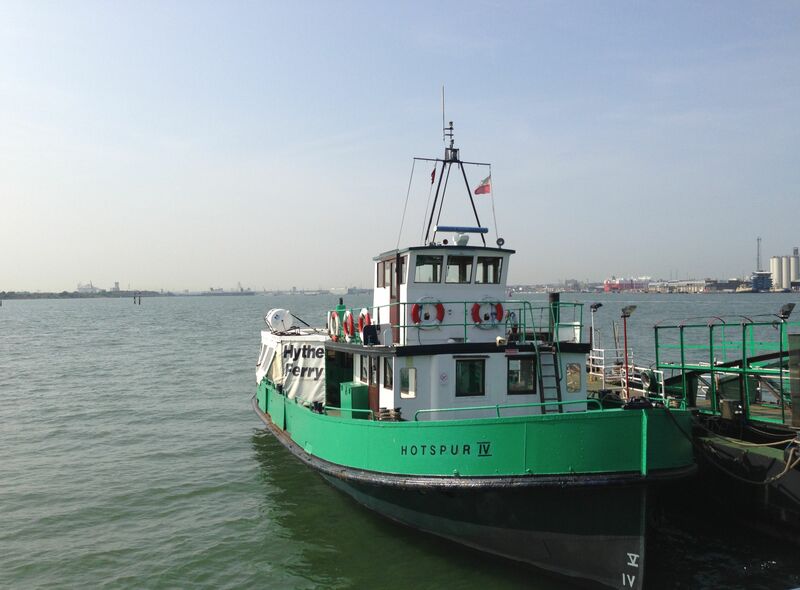 I had to navigate through a maze of roads from the ferry, over the Itchen Bridge to Woolston, then all the way down to Hamble-le-Rice where I got another small ferry over to Warsash. 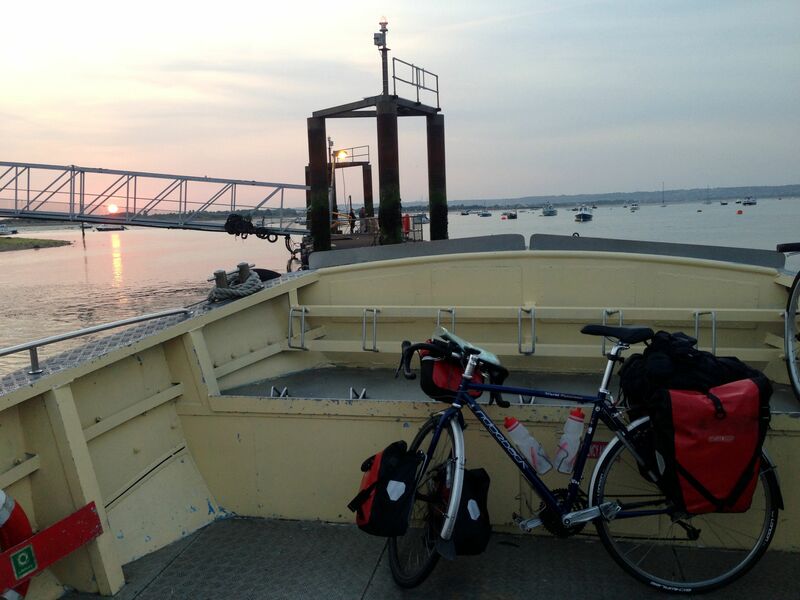 The ferry was very pink, but again I didn’t have to take all my panniers off which was good. More slightly confusing roads followed as I pedalled down to Gosport, via Titchfield and Stubbington, and a few cycle paths that got me lost in foliage. 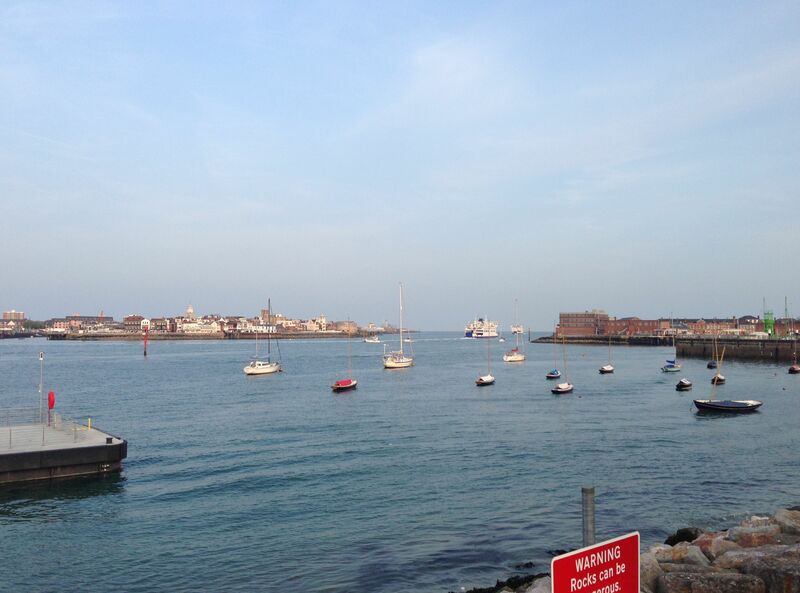 I had to use Google maps a few times via my phone to work out where I was going, but eventually made it to Gosport and the naval base where Mark and Cecily live. I timed things just right as they were just tucking into a BBQ when I arrived, and had some spare food on offer. Never one to turn down free calories on a tour I tucked in, enjoying a good catch up. The food was well timed as I hadn’t really eaten anything aside from the odd banana since breakfast, and still had several miles and at least one more ferry crossing to do before I reached the campsite for the evening. 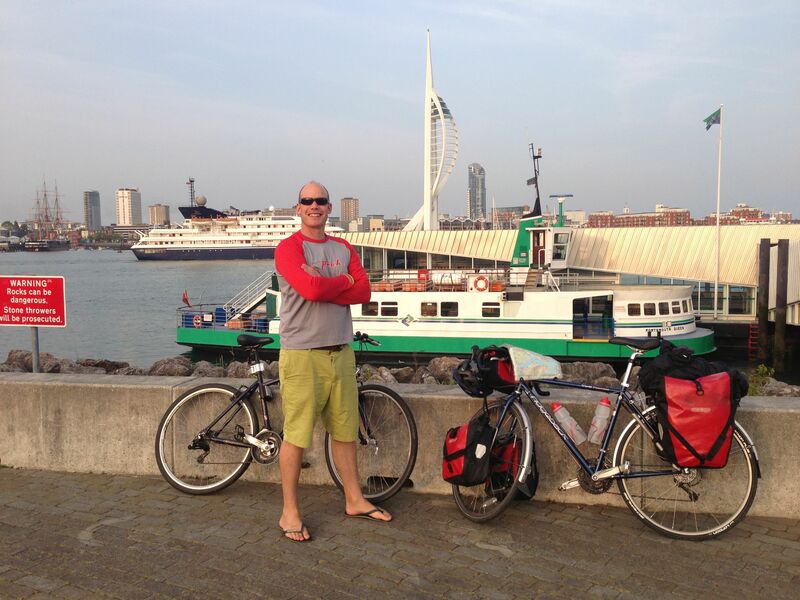 It was time to press on all too soon, however Mark offered to guide me to the ferry that would take me from Gosport over to Portsmouth, rather than having to cycle all the way round to Fareham and back down again. 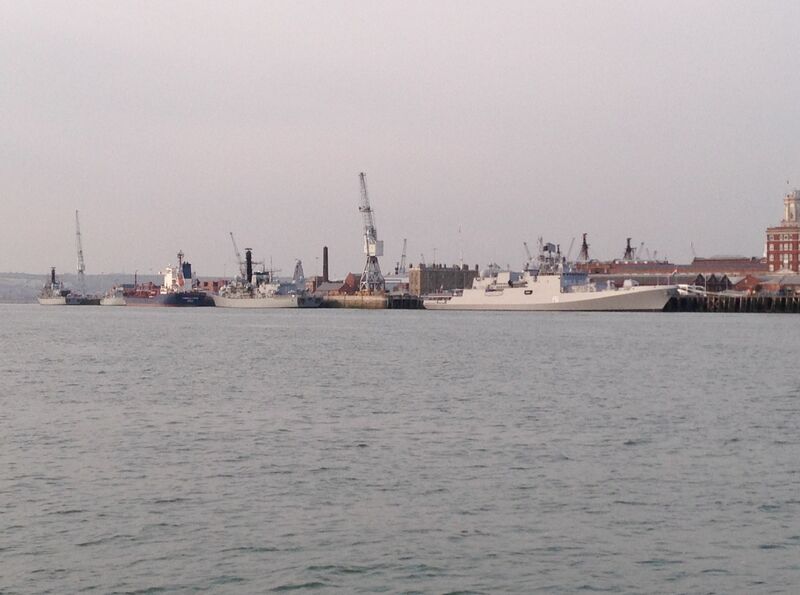 We cycled past lots of bits of the naval base, including the old Haslar Military Hospital which is sadly now closed. It was sold on to contractors for a pittance by the government, and the contractors then made a mint (millions of pounds) selling off the fittings as scrap. Another victory for the tax payer, not. We arrived at the ferry port and Mark kindly bought me a ticket, before waving me off as I embarked on the short voyage over to Portsmouth. It had been great to see them all, but it was going to start getting dark soon and I needed to get to the last ferry of the day over to Hayling Island before it shut. 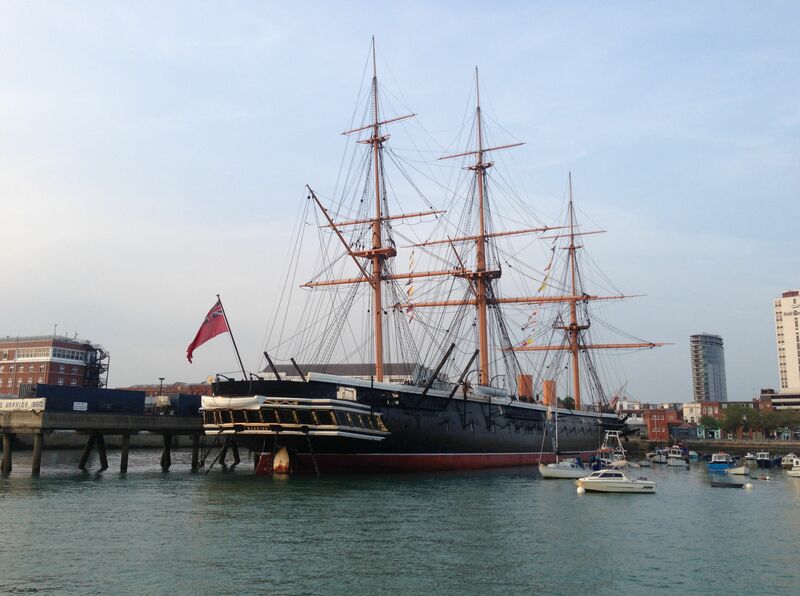 HMS Warrior was pretty impressive, as were lots of the ships moored up in Portsmouth, however I didn’t have time to gawp as I sped through Portsmouth and Southsea, down to the ferry at Lock Lake. I arrived with 10 minutes to spare, and waited for the boat as the sun started to get lower in the sky. It was about 21.00 by this point. I was able to wheel my bike onto this ferry too, and didn’t have to take off my panniers. It only cost a few quid for the trip over, and I sat back and enjoyed the view. 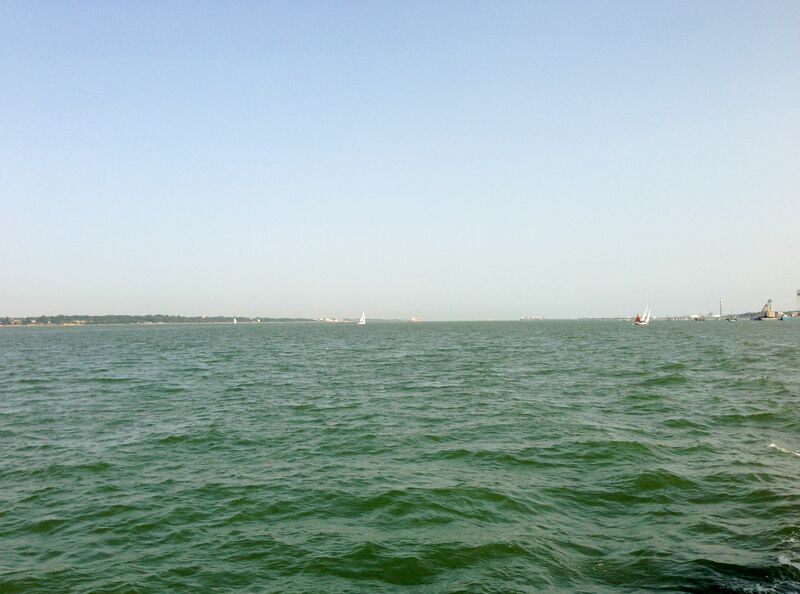 We passed a couple in a dingy trying to get back to their yacht, however their outboard engine had stopped working. 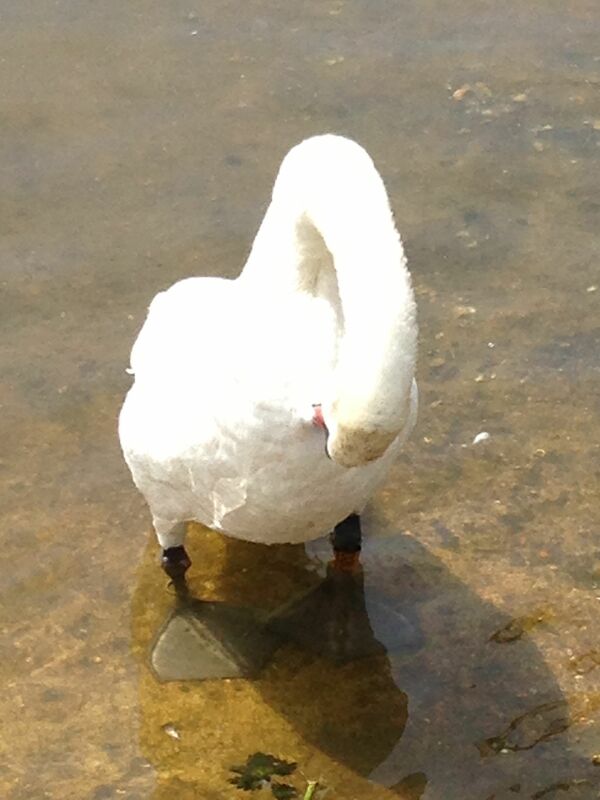 He declined an offer of help, getting his oars out to row the last bit. 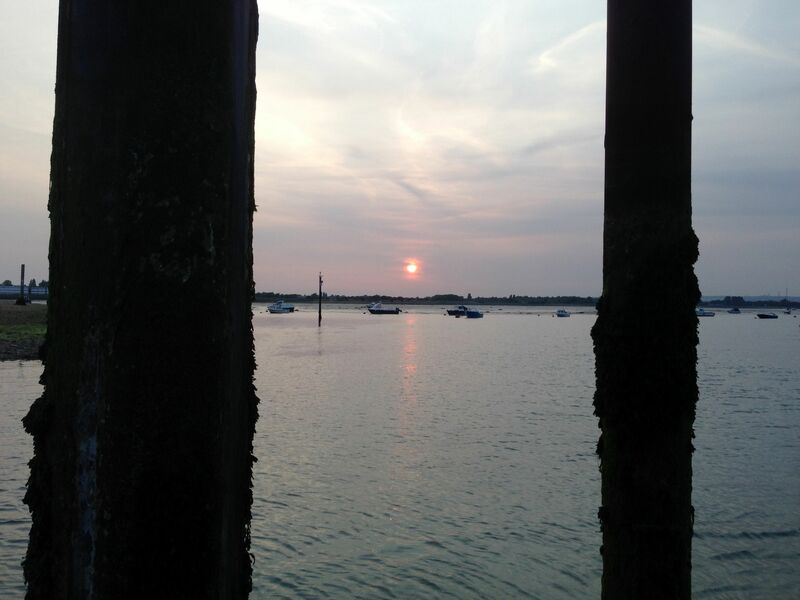 It got dark pretty quickly as I cycled north through Hayling Island back towards the mainland. I was able to use cycle paths through the nature reserve, passing a pony and trap at one point; a perfect way to enjoy a pleasant evening. I had to get my lights out when the cycle paths ran out and was back on roads. 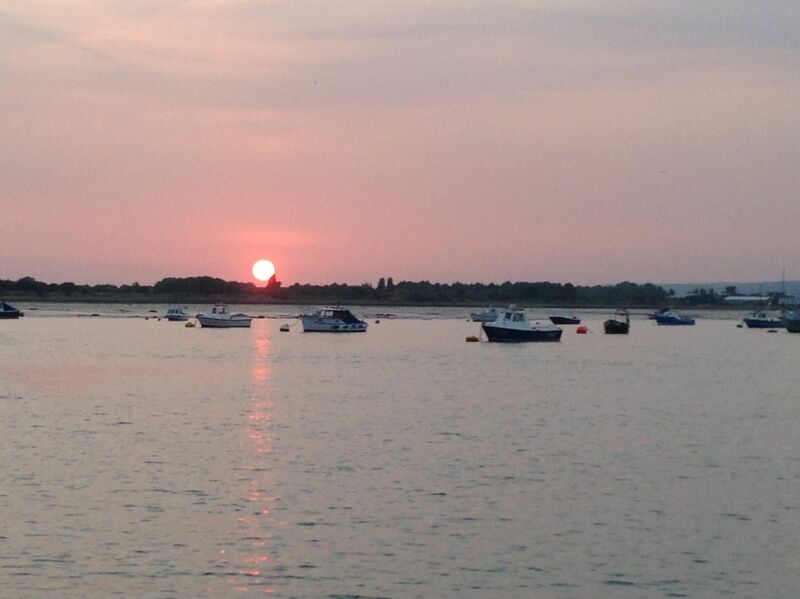 The next bit wasn’t too pleasant as I had to cross the A27 and join the A259 riding east to Emsworth. The road was a little busy and drivers aren’t so sympathetic to cyclists in this part of the UK, so I was on high alert as I pedalled on to meet Ian at the campsite we’d agreed on near Southbourne. I stopped briefly in Emsworth at a Co-op to pick up a few supplies for breakfast, and some chocolate milk for refuelling purposes. Milk is the best thing, better than Lucozade or suchlike, as it contains protein which helps repair muscle damage, as well as lots of calories. We’ll have to go back to Wales again soon for another hike and wild camping session. It was a great few days, if a little windy. The funniest bit was when Mike’s sleeping mat somehow became dislodged from his rucksack half way up Pen y Fan, and due to the wind sailed off into the distance. He had to use pine needles for a mattress after that. 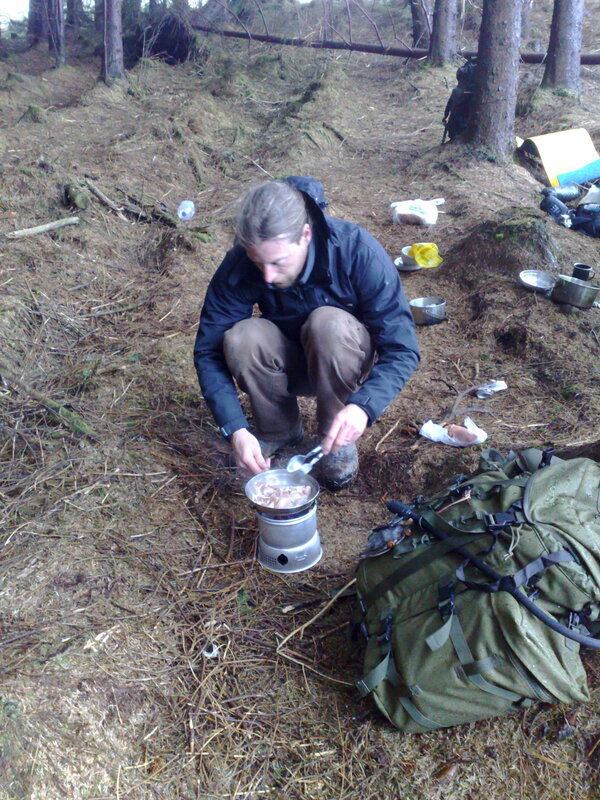 I might have to write a belated blog about that trip at some point; some excellent camp cooking was had. Back to the present; Loveders campsite was packed with people using it as a base for the Goodwood Festival of Speed, which we hadn’t known about and came as somewhat of a surprise. Thankfully it’s a large campsite and we were able to find a spot to squeeze in, and got some free chicken kebabs off our neighbours who were done BBQ’ing. Result. After setting up we adjourned to the on site bar for a few beers, which was still open despite it being well past 22.00 by this point. Thankfully I was pretty quick at setting up my tent by this point, and Ian only had a bivvy bag to contend with as he was travelling light; with the weather this good you didn’t really need a tent anyway, and he didn’t have to worry about getting tent pegs into the rock hard ground. We ran into the campsite ‘Colonel’ before leaving the bar, who was a little tipsy but quite a character, proceeding to tell us how the lights all worked. I’m not quite sure what he was going on about but it was all fun. We retired for the evening amongst literally hundreds of other tents and camper vans, with the glowing embers of dying BBQs twinkling in the night, and a sky full of stars. I’d covered around 80 miles today, which was a result after yesterday’s record leg. 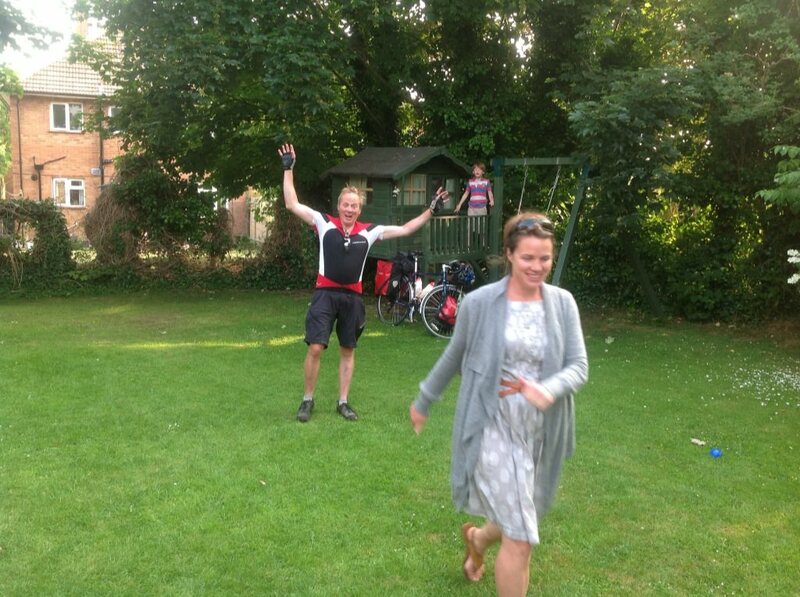 This entry was posted in Bike around Britain 2013 and tagged adventure, bicycle, bike, Bike around Britain, charity, countryside, cycle, cycle touring, cycling, expedition, fundraising, outdoors, Portsmouth on September 29, 2013 by SelfPropelled. 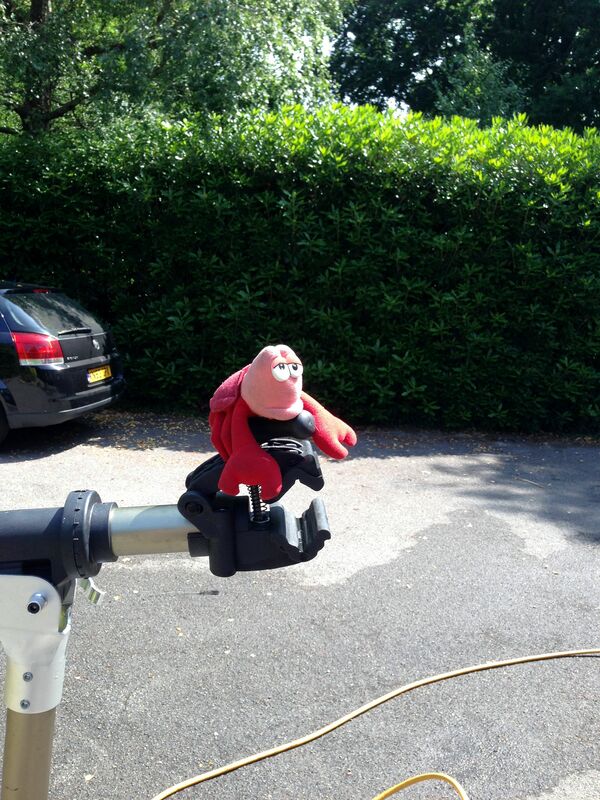 Have fun cycling on the continent, aiming to get there myself at some point this year.